One of my highlights not just of this year's Comic-Con, but of all the 14 years I've attended Comic-Con, occurred this July 13, the day Nickelodeon was most heavily promoting the new TMNT CGI cartoon series. After spending a day full of talking to the press, including the TMNT panel in the morning and a lunchtime autograph signing, that Friday afternoon the brotherhood of Sean Astin, Greg Cipes, Jason Biggs, and Rob Paulsen were on the other side of a table talking to little ol' me. It had been meant to be a shared roundtable experience, with other interviewers, but the way circumstances worked out I found myself going solo with them. I wasn't quite prepared for that! But luckily they bounced thoughts off of each other quite naturally, which brought out some fun conversation and interesting information. I had to miss the IDW panel in order to make this appointment, but it was obviously well worth that sacrifice. I took the audio I recorded and produced it into the video below. Enjoy! A huge hand of thanks to everyone at Nickelodeon, especially the entire voice cast! Today's a two-fer New Comic Book Day! 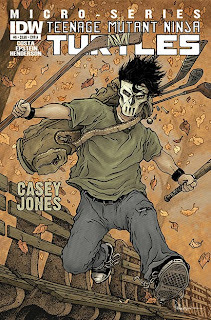 So grab Casey Jones when you pick up issue #12. Cover A: David Petersen (color). Cover C: David Petersen (black & white). 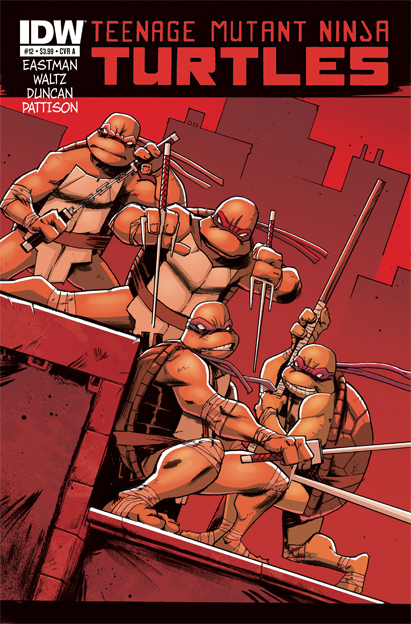 TMNT #12 is out today! And as it turns out, this is Dan Duncan's last issue on art duties. Many thanks to Dan for all his hard work this past year, which has delivered the Turtles' incredible return to comic book shelves! And good luck on your next adventure! 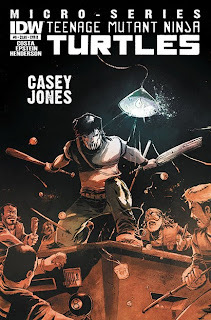 Check out the issue #12 preview! At this year's San Diego Comic-Con, Nickelodeon hosted a panel that gave fans a sneak preview of the new series, as well as a chance to see and hear the new voice actors. After all the panelists were brought out, Executive Producer Ciro Nieli showed us "The Pitch" he had presented to Nickelodeon, which ended up getting him the job. We were also shown an early test clip of animation. After Ciro's time was up, the new voice cast for the show answered questions from moderator Rich Magallanes, Senior Vice President of Nickelodeon Animation. As we've known, the cast includes Jason Biggs (Leonardo), Sean Astin (Raphael), Greg Cipes (Michelangelo), Rob Paulsen (Donatello), Hoon Lee (Master Splinter), Mae Whitman (April O'Neil), and Kevin Michael Richardson (Shredder). Below is a collection of all the video clips I personally recorded during this panel. I've also inserted some of the animation clips we were shown during the panel. Convention rules didn't allow the recording of these clips during the panel, but Nickelodeon released them online later that day. 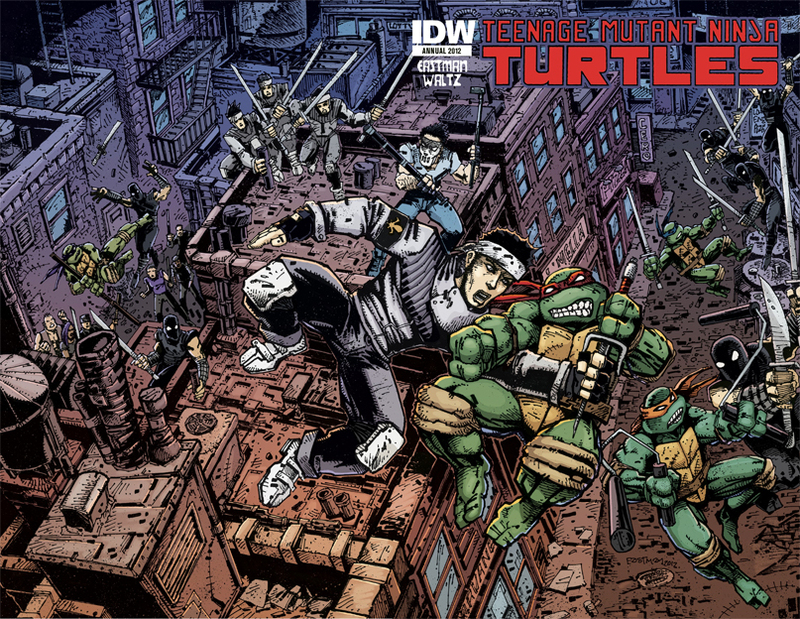 Last Friday at Comic-Con in San Diego, IDW announced two new TMNT titles that will be out later this year. 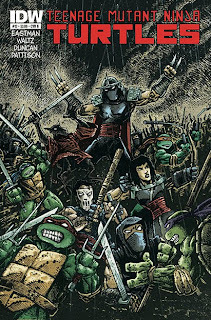 First up, "Teenage Mutant Ninja Turtles Annual 2012" by Kevin Eastman and Tom Waltz. Releasing in October this year, Teenage Mutant Ninja Turtles Annual 2012 follows the adventure of Raphael and Casey as they find themselves in the middle of a criminal escapade gone wrong. 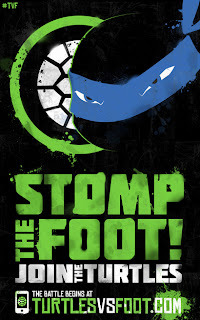 Rival clans jockey for power in the NYC criminal underworld, and the Ninja Turtles are drawn into the chaos. 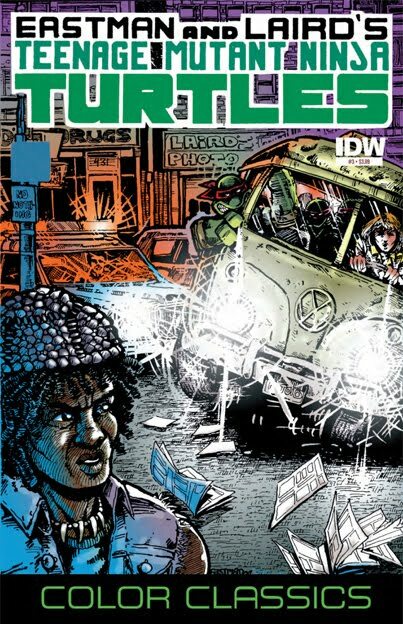 Expect the unexpected in this exciting, all-new tale that sets up a crucial future TMNT storyline. The Annual will be 48 pages and in full color, with a retail price of $7.99. 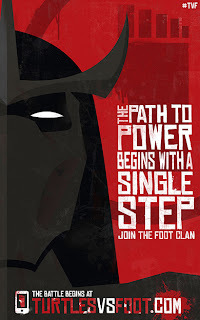 Up next is "Secret History of the Foot Clan," a four issue mini-series due to start in December. The series is written and drawn by Mateus Santolouco, with Erik Bunham co-scripting. And an unofficial announcement: I was able to confirm with Tom Waltz that IDW will be publishing a TMNT series to tie-in with the new Nickelodeon cartoon, although there is no projected time table for when we can expect to see that. People who were spotted by the prize crew wearing their trucker hat could win a bag of TMNT goodies. Where the prize crew lurked was a bit of a mystery, but I finally spotted them running through the line to get into the TMNT panel on Friday morning, which was when I got my prize bag. I spotted them again circling the Nickelodeon booth on Saturday morning, where there was a constantly long line for the merchandise booth. The prize bags were really neat tote bags (first seen at Toy Fair this past February) that were for sale at the merchandise booth for $20. Inside the bag the contents varied, but generally included a couple of posters (one a recreation of the first TMNT comic book cover with the new Nickelodeon CGI Turtles, one a Turtle dressed as the Mona Lisa), a T-shirt or two (the TMNT shell shirts or designer shirts available from the merchandise booth), and an autographed toy from the personal collection of Kevin Eastman. One of the tasks on the Turtles Vs. 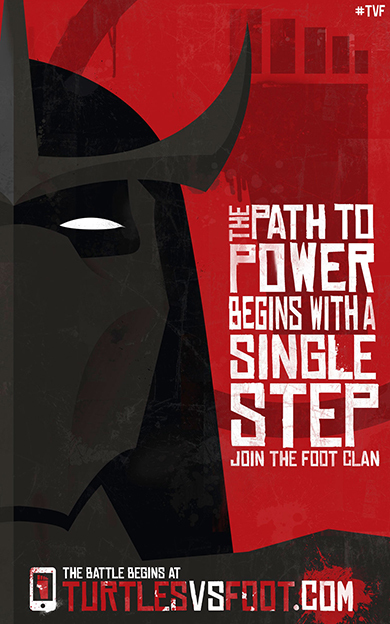 Foot website allowed you to receive a call from either Splinter or Shredder (depending on the side you had chosen). You can hear these two pre-recorded messages below. If you called back the number you received these two calls from, you heard another message inviting you to leave a message. 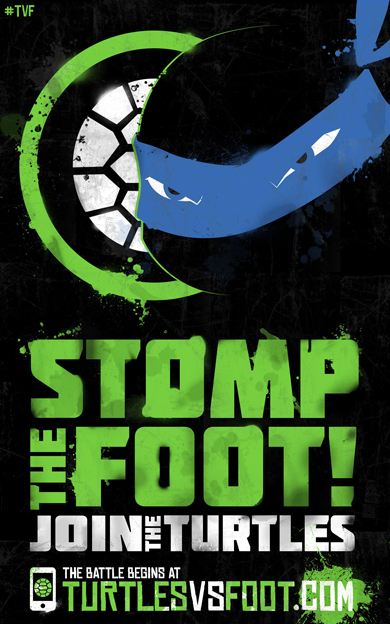 In the end, to no surprise, the Turtles won the battle against the Foot! Turtle Power! 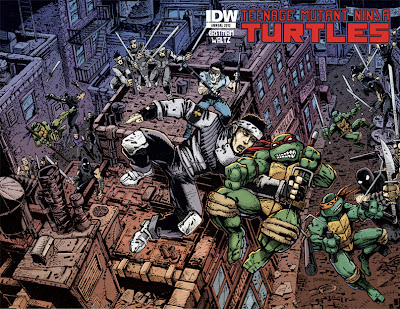 IDW editor Bobby Curnow has announced on the IDW message boards that TMNT #12 will be Dan Duncan's final issue as artist. Unfortunately, during the production of TMNT #11, Dan let me know he wouldn't be able to continue after #12. So what was going to be a 2-issue hiatus has turned permanent. He got a new gig in the world of TV animation. Dan let me know with ample time, and with LOTS of gratitude, both for the opportunity, and for the fans. He's grown to be iconic with IDW Turtles and will be missed a lot. He knows he's welcome back, and we've discussed some exciting possibilities for the future, though they will be shorter in nature. At least for the foreseeable future. 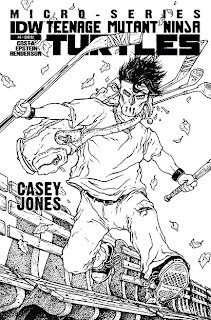 The hiatus Curnow mentions was meant to be a 2-issue break for Duncan, who has been working almost non-stop of the TMNT book for the past year. 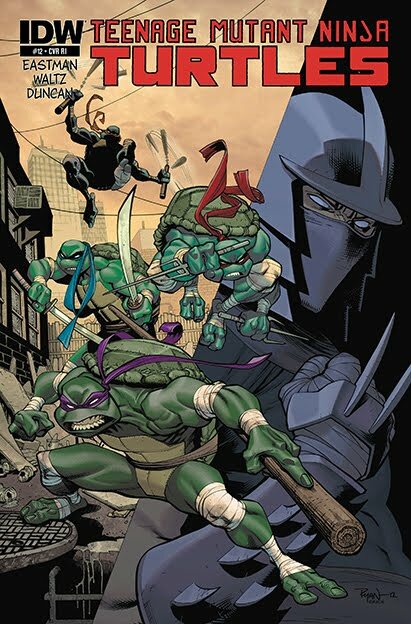 Andy Kuhn (TMNT Micro-Series #2, Michelangelo) was scheduled to fill-in for issues #13 & #14, and will now also be on issues #15 & #16. No permanent replacement has been named yet. 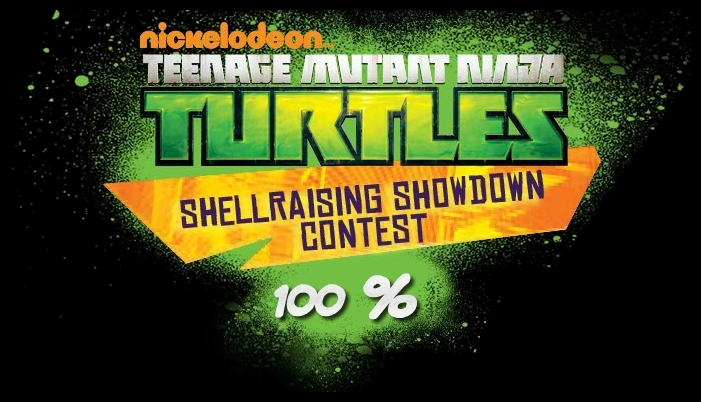 Target and Nickelodeon have launched the "Shellraising Showdown Contest" to celebrate the new TMNT toys from Playmates. The contest requires you to create a stop-motion ending to a comic book with your new Turtles toys. 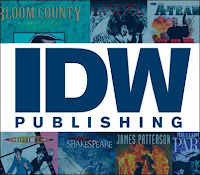 You can read the comic book, written by Tom Waltz from IDW, on the official contest website, or download it directly. Physical copies of this comic were given away in mass quantities at San Diego Comic-Con this past weekend. I have a stack of them that I will be distributing to Ninja Pizza readers in the near future! Rules and prize information are also available on the contest website. Good luck to all who enter! Happy Wednesday! For some of you, you're at or near San Diego, ready for that crazy annual event known as Comic-Con. If that's you, you don't care that today is New Comic Book Day. But for the rest of you, you can go commiserate with with your fellow geeks at the comic shop who are also not in San Diego. And for you lot, you get TMNT Color Classics #3! Cover A: Kevin Eastman & Peter Laird (color). 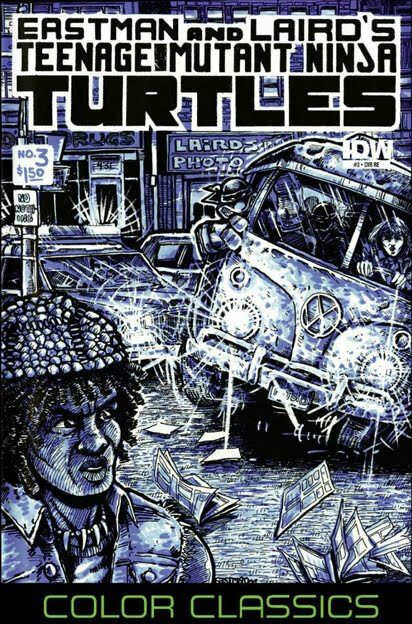 Cover B: Kevin Eastman & Peter Laird (mono-tone). 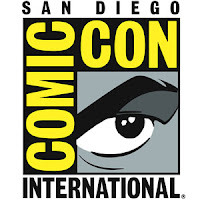 Comic-Con starts tomorrow! If you're lucky enough to be attending, there's a lot of exciting points of interest for TMNT fans. I've pulled out the biggest highlights and listed them below. It sounds like Nickelodeon has one or two other surprises in store, so be sure to keep following Ninja Pizza on Facebook and Twitter for all the latest news! Details on the availability of this figure haven't been released, but pictures of it appeared on Playmates' website last week. The current guess is that it will be available for sale at the Nickelodeon booth (#4113) for around $20. 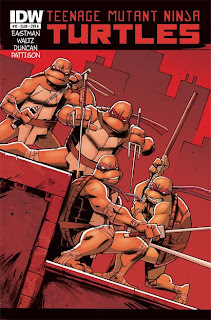 As previously reported, IDW will have a special Convention-exclusive variant of TMNT #11 at their booth (#2643) for $5. The 40 people who pre-ordered the special Convention bundle of the Ultimate Collection hardcovers will be able to pick up their purchases at the booth, as well. This item is not available for walk-up purchase. 10:15-11:15, Room 6BCF - Go Green! 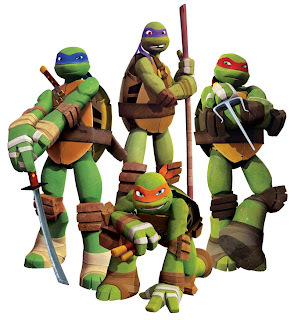 With the Lean, Mean, Ninja Team: Nickelodeon's Teenage Mutant Ninja Turtles! Experience Nickelodeon's very first Teenage Mutant Ninja Turtle Comic-Con panel, as executive producer Ciro Nieli sets up the new series and unveils never-before-seen footage. Meet the incredible Ninja cast: Jason Biggs (Leonardo), Sean Astin (Raphael), Greg Cipes (Michelangelo), Rob Paulsen (Donatello), Kevin Michael Richardson (Shredder), Hoon Lee (Splinter), and Mae Whitman (April O'Neil). Hear and see the radical undertaking of this 25-year-old property and some of the creative insights that have taken it to new and reinvigorating heights. Prepare to be shell-shocked! Moderated by Rich Magallanes, senior VP of current series for Nickelodeon. 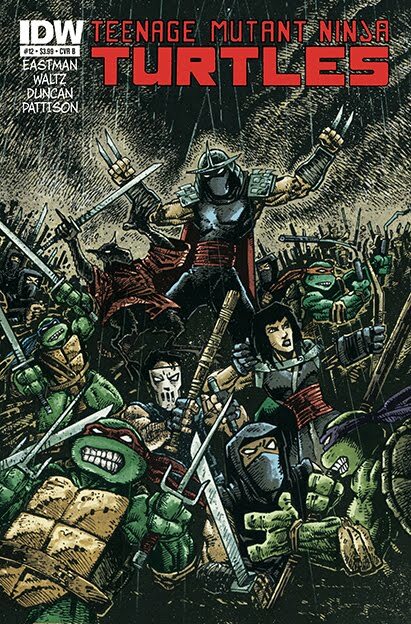 Kevin Eastman - Expect to find TMNT co-creator Kevin Eastman throughout the weekend at the Heavy Metal booth, #1529. Ernie Reyes Jr. - Ernie, known to TMNT fans as Donatello's stunt double in the first TMNT movie and Keno the Pizza Delivery Boy in TMNT 2, will be at booth #5112-5118 with his new comic book, Sonny's Dragons. 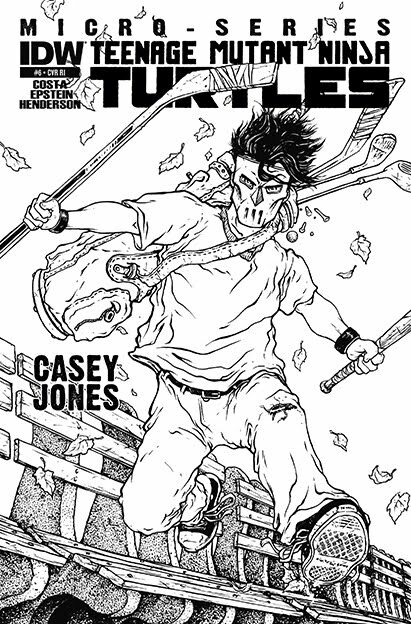 This comic book is of particular interest to TMNT fans, as it was drawn by the one and only Jim Lawson! 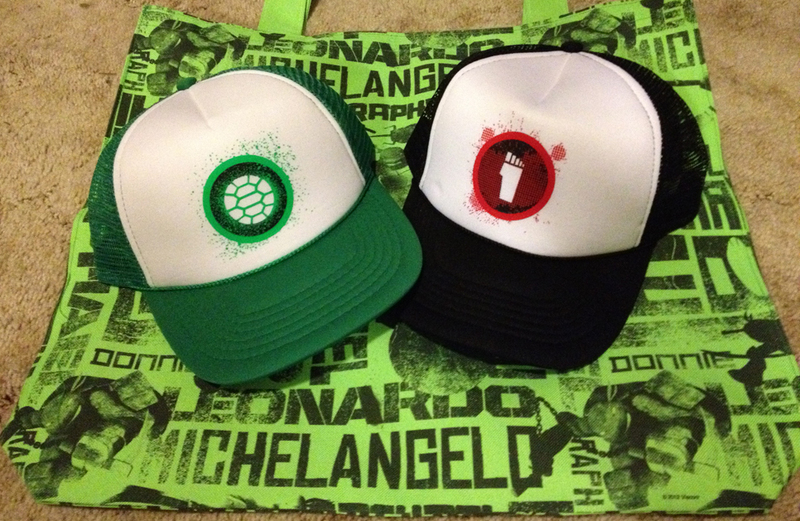 Michael Dooney - This TMNT artist extrodinare will be at Artists' Alley booth #DD-22 throughout the weekend. Dave Garcia - Mr. Garcia did work on the old TMNT Adventures comic book series. He and his wife Monica also created the character Panda Khan, who TMNT fans should know as an old Playmates action figure. He will be at Artists' Alley booth #FF-11. Erik Larsen - Find Erik Larsen of Image Comics fame, who was also a key player in the publishing of TMNT VOl. 3, at Artists' Alley booth #II-16. 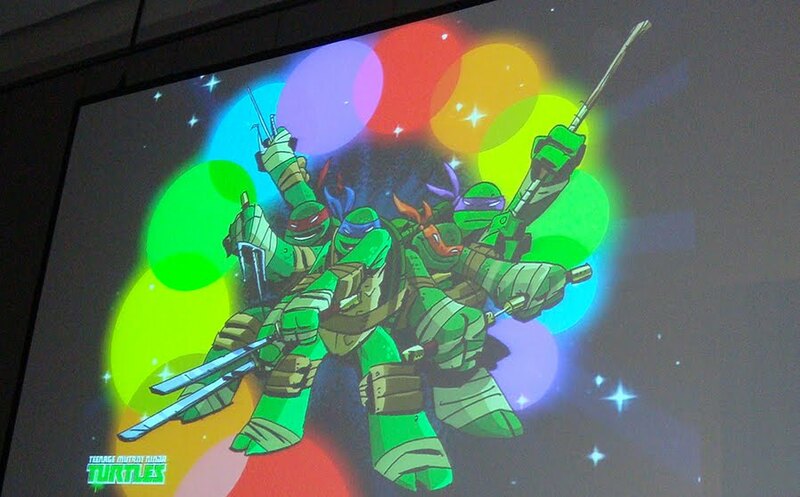 James Silvani - James Silvani has done some TMNT licensing art in recent years. You can find him at Artists' Alley booth #DD-11. Nickelodeon has announced that the new TMNT CGI series will debut on September 29, 2012 at 11am. The one hour premiere event will launch the 26-episode season. Nickelodeon also officially announced for the first time three additional members of the voice cast: Mae Whitman as April O’Neil, Hoon Lee as Master Splinter, and Kevin Michael Richardson as Shredder. All three, together with the voices of the Turtles (Jason Biggs, Sean Astin, Greg Cipes, and Rob Paulsen) will be appearing at Comic-Con in San Diego on Friday. 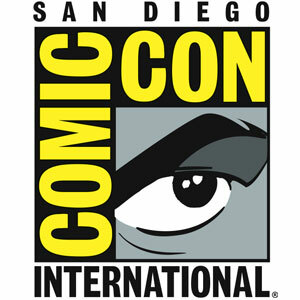 Stay tuned to Ninja Pizza all week for full Comic-Con coverage!! 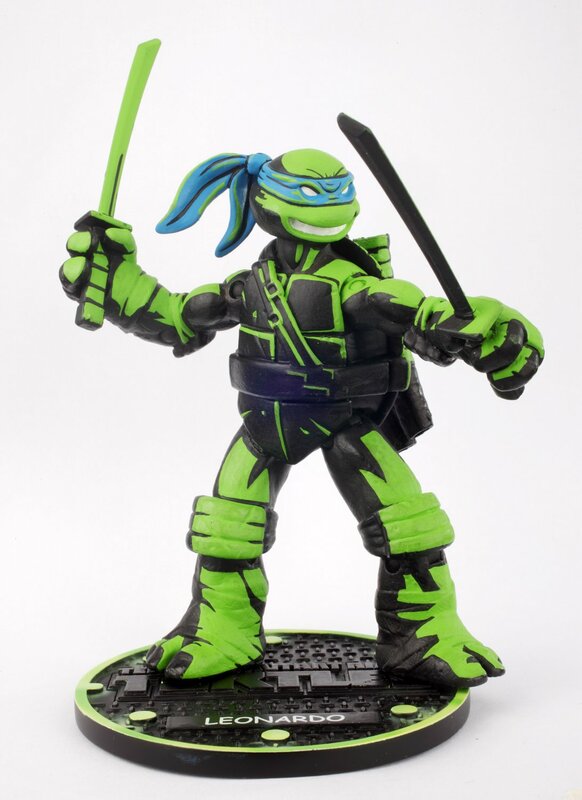 Despite original reports that the new TMNT action figures would begin appearing in stores in August, some stores have already received their shipments and are selling the new line. Early reports had the toys appearing in some Toys R Us stores. These sightings have included the action figures, vehicles, and role play toys. Target stores have also begun receiving their shipments, although these haven't yet been placed in the aisles. A savvy member on the Technodrome forums was able to provide the DPCI number, which can be used to check stock of an item online and in stores. The DPCI number of the basic action figures is 087-06-0494. Click here to check stock at your local Target store. If your store has the figures in stock, you will have to go there and find an employee to help you get the figures from the back room. Provide them with the DPCI number to help them find them as quickly and efficiently as possible. Target stores are holding the figures in the back rooms for an aisle reset that is scheduled for July 29. Some employees/stores may give you trouble and refuse to sell the figures to you because of this date. People who have run into this problem have had luck by requesting to talk to a manager. Whatever they try to tell you, let them know that this date is not a hard sell date. If they try to tell you that the registers won't let them sell the figures to you, this is a lie. If you still have no luck, try another Target and/or a different employee. I personally had to try two Targets, as the first wouldn't sell to me. The second did, and I purchased the four Turtles pictured above. Good luck to everyone on the hunt!